In the tradition of patriotic AIP fare such as Rage to Kill (1987) comes David Prior’s Jungle Assault. After some initial mindless shooting with no setup, we see it was a flashback to the Vietnam days of Becker (Ted Prior) and Kelly (Zipp). Since the war ended, these beer-swilling buddies have really hit the skids. They live in a broken-down hovel and face eviction, and they spend any money they may have on booze. After taking on the goons of local tough man Crusher (Swalve), as well as Crusher himself, in one of the silliest of the many barfights we’ve seen over the years, the commanding officer of the two men pays them a visit. General Mitchell (Smith) tells the two dudes that his daughter Elaine (Moore) has joined up with the commies in South America. Reasoning that “any blade can get dull, but the steel’s still there”, he enlists the men to infiltrate the baddies’ compound and rescue the girl. But they will get no help or recognition by the U.S. Government. The guys agree, and once behind enemy lines in some hellhole like Nicaragua or Cuba (but actually Alabama), they must face the evil woman Rosa (Rosado) and her mercenary partner John McClusky (Marriott). Will the two dum-dums be able to kill all the commies, and not just bring Elaine back, but very quickly convince her that her whole ideology is incorrect? 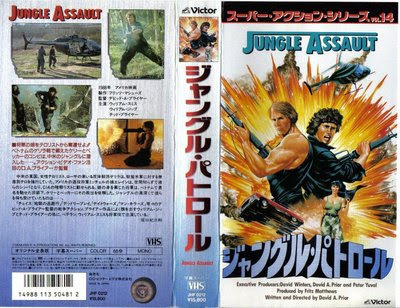 Produced by Fritz Matthews, Jungle Assault is unbelievably low-budget looking and junky. Not that that’s necessarily a bad thing, but it is also one of the most cliche-ridden movies you will ever see. Quite possibly every tired line or situation is included, with seemingly no thought whatsoever to putting a new spin on things, or even any extra energy into them. Some of the dialogue is so cliched its funny, but that’s about the only saving grace there. The main heroes as played by Ted Prior and William Zipp would today be played by Christian Bale and Curtis Armstrong respectively, and despite their lack of intelligence, somehow are able to, after years of alcohol abuse, not only NOT have beer guts, but also are incredibly ripped for some reason. Prior wears a Springsteen “Born in the USA” shirt and Kelly holds his machine gun incorrectly. Prior’s dialogue consists mainly of various grunts and yells, while the bad guys are continually spitting. William Smith brings his ultra-gravelly voice, while Marriott as McClusky brings some sort of Liverpudlian or possibly Mancunian accent to his ruthless bad guy role. 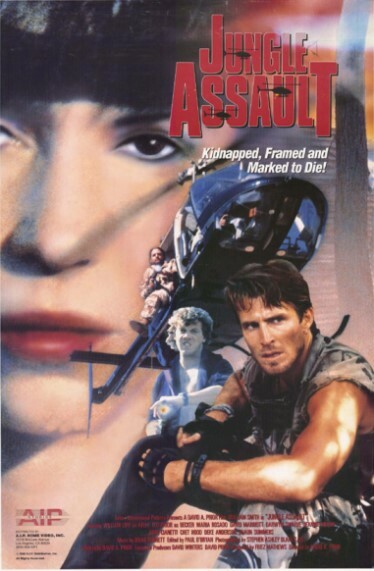 Sure, Rosa, McClusky or their army of thugs could have killed Becker or Kelly a million times over, but they never do, leading to the prerequisite torture scenes. The shooting scenes feature the same wound over and over again, a very silly, misty shotgun blast. This movie is dumb with a capital D. It adds nothing to the genre, you don’t care that much about the characters and it provides minimal entertainment value. It features scenes you have seen a million times before and that leads to little excitement. It makes you not even care about a baddie’s death by rocket launcher. Because of this, the film is instantly forgettable. I guarantee the next day after watching it, all memory of it will be gone in your mind. Featuring a really funny last line of the movie, and odd, inappropriate music throughout, but capped off by one of the best/funniest/silliest/most catchy end credits songs ever, “Freedom” by Brian Bennett, the only reason to watch Jungle Assault- and there ARE worse movies out there - is if you are an AIP completist (and if you are, God help you) - or you want to hear the great final song, the best part of the film. This looks like some "so awful it's good" fodder and it has Ted Prior of Deadly Prey fame, but you guys seem to have a lot of issues with it. I'm curious to know how it garnered a three-star rating. It probably should be 2 1\2 but the song and the silly acting bumped it up to 3. Mmm... Deady Prey. Now there's a movie! That is going to the last movie posted for AIP-April! We loved it also! That's too bad that this one didn't work. Still, AIP April is off and running, so I can't wait to see what's next. Jungle Assault was almost good. But the end song Freedom is worth the purchase of the tape.